Written and directed by Greta Gerwig, Lady Bird is the story of a Catholic high school senior dealing with growing pains and her troubled relationship with her mother. Set in 2002 Sacramento, the film is a look into the life of a young woman as she tries to find herself as well as dealing with all of the challenges in becoming a woman. Starring Saoirse Ronan, Laurie Metcalf, Tracy Letts, Timothee Chalamet, Lucas Hedges, Beanie Feldstein, Stephen McKinley Henderson, and Lois Smith. Lady Bird is a delightful yet witty film from Greta Gerwig. The film follows a year in the life of a young woman as she is about to become a senior where she deals with her identity, her surroundings, and her family including her mother. It plays into the world of growing pains for this 17-year old woman in Christine “Lady Bird” McPherson (Saoirse Ronan) who wants to go to a college in the East Coast and away from her old life of Sacramento. Having to go to a Catholic high school since her older brother had been stabbed at a public school, Lady Bird also deals with that situation though she has company in her best friend Julianne “Julie” Steffans (Beanie Feldstein) only to become infatuated with a musician in Kyle Scheible (Timothee Chalamet) where she tries to fit in with the popular crowd. Greta Gerwig’s screenplay follows Lady Bird’s own search for an identity as well as doing things that upset her mother Marion (Laurie Metcalf) who is struggling with all sorts of things as her husband Larry (Tracy Letts) had just been laid off. The script opens with Lady Bird and Marion driving around in the middle of California looking for colleges as it showcases the turbulent relationship they have as the former wants something more while the latter feels like Lady Bird should settle for less and accept the realities of her situation. Lady Bird is moody as she also feels like her mother hates her as she can turn to her easy-going father who is encouraging her despite some of the financial difficulties at home. Yet, Lady Bird also struggles to find love as she would befriend a classmate in Danny O’Neill (Lucas Hedges) who would act in the play she and Julie take part in. Still, Lady Bird becomes attracted to Kyle during Thanksgiving night with Danny, Julie, and a friend as it would lead to trouble with Lady Bird spending time with Kyle and a popular girl in Jenna Walton (Odeya Rush). It adds to Lady Bird’s growing confusion and desire to leave Sacramento but revelations about Kyle as well as dealing with her ambition knowing it would cause some pain between her and her mother. Gerwig’s direction is very simple as she doesn’t go for a lot of stylistic shots to capture a moment in time in an environment that is quaint and interesting in a city like Sacramento. The city itself is a major character in the film while Gerwig would also shoot on location in Los Angeles and New York City for small bits with the latter is a place that Lady Bird wants to go. While there are some wide shots of the locations including certain places that is key to Sacramento, Gerwig would emphasize more on intimate and simpler compositions in using medium shots and close-ups. Even in the way she captures the interaction between Lady Bird and Marion such as the opening scene of the two listening to a reading of The Grapes of Wrath as it starts off as quaint until they start to argue. It’s among these offbeat moments that add to the humor including Lady Bird’s audition scene for a play and her own campaign posters that she created for class president. Gerwig would also showcase Lady Bird’s need to fit in as she claimed to live in this house that she and Julie would walk pass every once in a while. Gerwig would also maintain something low-key in the drama to play into the relationship between Lady Bird and Marion in how they react toward one another. Notably in the third act as it relates to Lady Bird’s audition and where she wants to go as Marion’s response is one that is surprising in its restraint. It would showcase that sense of difference in the two women but also how similar they are with Lady Bird forcing to think about the essay she wrote as it relates to her hometown. 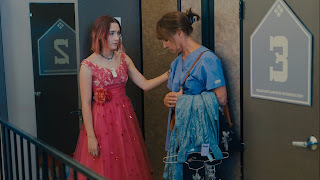 Especially as the film’s ending has Lady Bird make a decision that would show the sense of maturity that she needs into becoming a young woman but also hold on to the bond between mother and daughter. Overall, Gerwig crafts a compelling and intoxicating film about a young woman dealing with growing pains and her tumultuous relationship with her mother. Cinematographer Sam Levy does excellent work with the film’s cinematography as it is largely straightforward for many of the scenes set in the day including the daytime exteriors with some low-key lighting for the scenes set at night. Editor Nick Houy does terrific work with the editing as it is very straightforward without delving into a lot of style but does provide some nice rhythmic cuts for some of the film’s humor. Production designer Chris Jones and set decorator Traci Spadorcia do fantastic work with the look of Lady Bird’s room at her house as well as the classrooms and some of the places she goes to. Costume designer April Napier does nice work with the costumes as it is largely casual with the exception of the school uniforms the kid wears as well as the Goth clothing Lady Bird’s brother and his girlfriend wears. Sound editor Paul Hsu does terrific work with the sound as it play into the way music is heard on location as well as some of the sounds that happen at Lady Bird’s home. The film’s music by Jon Brion is brilliant for its low-key score with elements of jazz and pop to play into the humor and drama while music supervisor Michael Hill and Brian Ross provide a fun soundtrack of the kind of music that was being played in the early 2000s such as Bone Thugs N Harmony, Justin Timberlake, and Dave Matthews Band along with a mixture of classical, indie, and folk music that is played throughout the film. The casting by Heidi Griffiths, Allison Jones, and Jordan Thaler is incredible as it feature some notable small roles and appearances from Kristen Cloke as Julie’s mother, Kathryn Newton as Lady Bird’s classmate Darlene, Laura Marano as a theater performer/classmate in Diana, Marielle Scott as Miguel’s girlfriend Shelly, Jake McDorman as the school’s math teacher Mr. Bruno whom Julie has a crush on, Odeya Rush as a popular girl in Jenna Walton that Lady Bird befriends, and Stephen McKinley Henderson as the school’s drama teacher in Father Leviatch as a man that is still dealing with loss as he tries to teach the kids drama. Jordan Rodrigues is terrific as Lady Bird’s older half-brother Miguel who is trying to find his own path in life after college where he also deals with his sister’s attitude. Lois Smith is fantastic as Sister Sarah Joan as this teacher at the Catholic school who understands Lady Bird’s rebellion as she is this unconventional authority figure that is offbeat but also very funny. Lucas Hedges is superb as Danny O’Neill as a classmate who joins drama as he is someone Lady Bird has feelings for only to see that he is dealing with some personal issues. Beanie Feldstein is excellent as Julie as Lady Bird’s best friend who feels left out when Lady Bird hangs out with Jenna as she is just trying to deal with high school and finding herself as it’s a funny and heartfelt performance from Feldstein. Timothee Chalamet is brilliant as Kyle as this kid who is also a musician that Lady Bird falls for as he is her idea of what is cool as he is someone that is intriguing although very flawed. Tracy Letts is amazing as Lady Bird’s father Larry as a man dealing with depression over losing his job as he does whatever it takes to encourage Lady Bird and make her feel good. 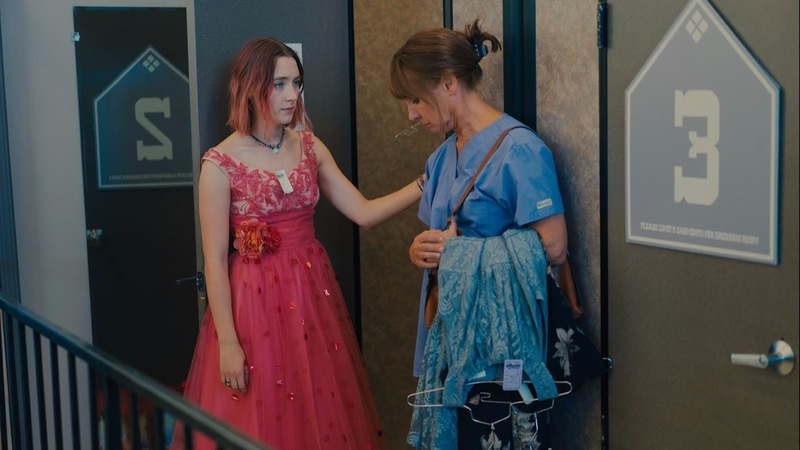 Laurie Metcalf is remarkable as Lady Bird’s mother Marion as a woman that is dealing with her daughter as well as not wanting her to go far away as she also cope with the financial issues as it add to the tension between mother and daughter. Finally, there’s Saoirse Ronan in a phenomenal performance as the titular character as a young woman trying to figure out her identity and desire for culture where Ronan displays that air of humor and humility as a young woman just trying to figure things out as it is a career-defining performance for the actress. Lady Bird is a sensational film from Greta Gerwig that features incredible performances from Saoirse Ronan and Laurie Metcalf. Along with its supporting cast, engaging story, sumptuous music soundtrack, and its themes on growing up and trying to find an identity at a young age. It’s a film that showcases life of a young woman dealing with many issues as well as turbulent relationship with her mother who doesn’t want her to deal with disappointment. In the end, Lady Bird is a spectacular film from Greta Gerwig. Great review! I like how you said Gerwig didn't try to go for anything fancy, I really appreciated that. Some first time directors try too hard to get those arty shots (See Greg Nicotero on every episode of THe Walking Dead he's directed) and it almost always fails. I'm dying to see Ladybird, especially when I heard it's the best reviewed film, ever, on Rotten Tomatoes. Where do you rank it for 2017? It's not out until April over here, so will have to be patient! @Brittani-I'm glad Gerwig didn't try to do anything fancy either although this isn't really her directorial debut as she did co-direct a film some years ago during her mumblecore phase. I also think she just wanted to capture something real and in her hometown which is obvious that she is fond of. @Chris-Right now, it's in my top 10 of 2017 so far.